A selection of travel tales from around the UK and Ireland, all from the first-hand experience of the McKinlay Kidd team. With occasional guest posts from founders Robert Kidd and Heather McKinlay. Having spent the majority of my adult life living in a city I found Shetland to be one of the most spectacular places I have ever visited. 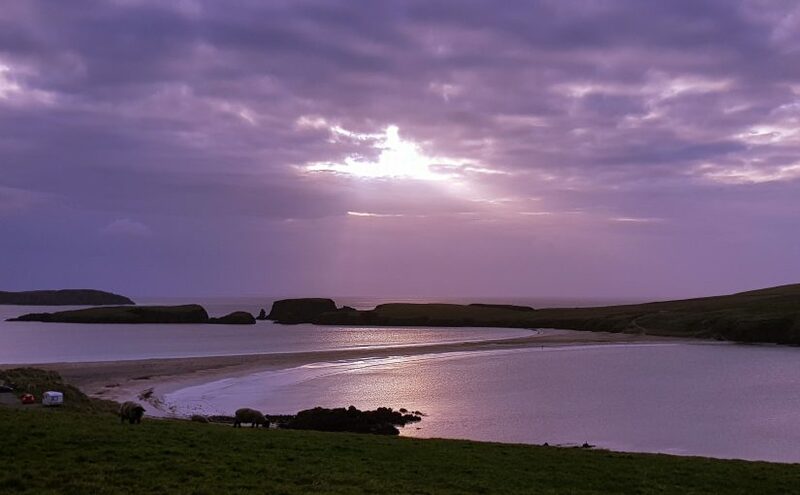 The shockingly beautiful and dramatic scenery really caught me by surprise and I must say that one of the highlights of my trip was St. Ninian’s Isle. I loved the contrast of a golden sandy tombolo beach followed by high jagged cliffs leading into the ocean. After a day of exploring the north of the Shetland mainland we decided to make our way south while the weather and daylight were still on our side. As we were driving through the tiny roads of Bigton we turned a corner and all of a sudden saw this stunning view appear out of nowhere in front of us. We parked the car and made our way down to the beach. As we walked across it was amazing not only how green the water was but also how on either side of the tombolo the colours looked completely different. We continued across the beach and up the little the hill to reveal a sheer drop on the far side. One minute we could have been on a tropical beach and the next we were watching the waves crash against the jagged cliffs: it felt like we were at the edge of the world. We spent a while exploring the area whilst soaking up the fresh, salty air and enjoying the peace and quiet of our remote surroundings. Shetland in general seems to have an amazing relaxing quality about it. For my entire time there I was able to unwind and let the stresses of day to day life simply melt away. It’s a wonderful feeling to have brought home from this trip. Words and Images from Daniela @ McKinlay Kidd. Daniela explore Orkney and Shetland on a recent trip to get to know the island – our brand-new Complete Orkney & Shetland holiday can help you do the same thing. 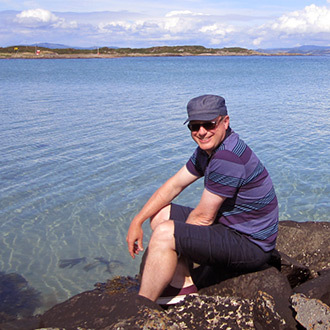 Get in touch and we will be delighted to arrange your Scottish island holiday. There’s something incredibly liberating about going on holiday to Shetland. I felt a million miles away from the hustle and bustle of everyday life as soon as I started my descent on to the Sumburgh runway. No book or documentary could truly prepare me for the stunning scenery sprawling around me and, despite the October chill in the air, I was glowing with excitement for the duration of my stay. Though I lost touch many years ago with a good friend from Shetland, I’ve never forgotten her great pride in calling this place home. Her stories and tales were the catalyst for me wanting to spend some time in what she had portrayed as a welcoming and community-spirited location. My expectations were exceeded hour after hour and I doubt I will ever find anywhere to rival the locals’ natural gift for hospitality. From my taxi driver to shop owners, I was welcomed with open arms. Shetlanders are fiercely proud of their history and heritage and it’s an absolute privilege to be invited in. On arrival, my tour guide, David, took me to a local café to discuss our day ahead. A renowned place for wildlife spotting with windows facing out to the bay, I sat entranced by the waves crashing around us and very nearly forgot to order from a packed menu of homemade delights. A hearty bowl of soup on a cold day, a colourful salad on a hot day or just cake for cake’s sake, this place is a must on every itinerary. After checking in to our accommodation for the night, I knew it would be a struggle to leave the history soaked hotel, roaring fire and comfortable bed behind. Staff, locals and visitors were all cheerful. The food was tasty, and there was a good choice of wines and an impressive whisky selection on offer too. For me, sincere hospitality needs complemented by enjoyable food and this location certainly has both. Though I have many fond memories of Shetland, the trip had a distinct highlight. My taxi driver not only got me from A to B safely, he was a fount of knowledge. So much so that after telling him the tale of my long-lost friendship, he told me that he in fact knew my friend – a close-knit community indeed! He put us in touch within hours. Sitting by my hotel’s roaring fire the following day, I looked up to see my friend smile just as she had done all those years ago, and I knew this was only the first of many more holidays to Shetland. If you would like to experience both Shetland and its neighbour Orkney together, take a look at our Shetland & Orkney Fly-drive itinerary. Been there, done that, where to get the T-shirt? 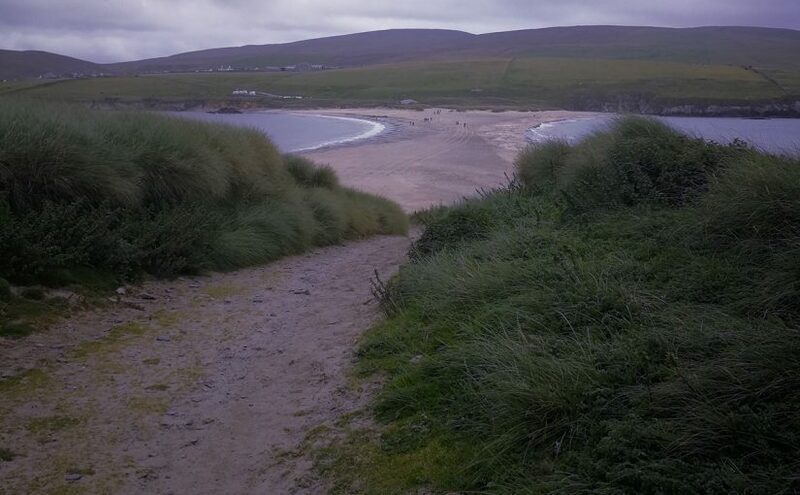 During my time at McKinlay Kidd, I’ve been lucky enough to travel to some amazing places in Scotland, and indulge my love of empty beaches, wildlife (particularly Shetland ponies) and seafood. One thing for sure is that I also really, really love a good gift shop – I can’t resist bringing back trinkets from my travels for my friends and family, as well as the obligatory sweet treats for the McKinlay Kidd team of course! Scotland still proudly promotes traditional crafting methods and celebrates original artwork and textiles. So, think beyond the cliché idea of Scottish souvenirs such as shortbread tins and bagpipe fridge magnets and take a look at my top gift shop recommendations. This former barley mill at Weisdale has been converted to a gallery featuring contemporary visual arts and crafts. It boasts an extensive range of locally produced prints, textiles and cards in the gift shop. The mill also houses a café serving light lunches, so is well worth a visit. If you do find yourself in the area, stop off at Shetland Jewellery en route! Situated on Armadale Pier in an idyllic location, Ragamuffin is home to the very best knitwear and original clothes. Beware though…this place is an Aladdin’s cave of treasures, so you may find yourself in here for a while. Don’t miss your ferry! 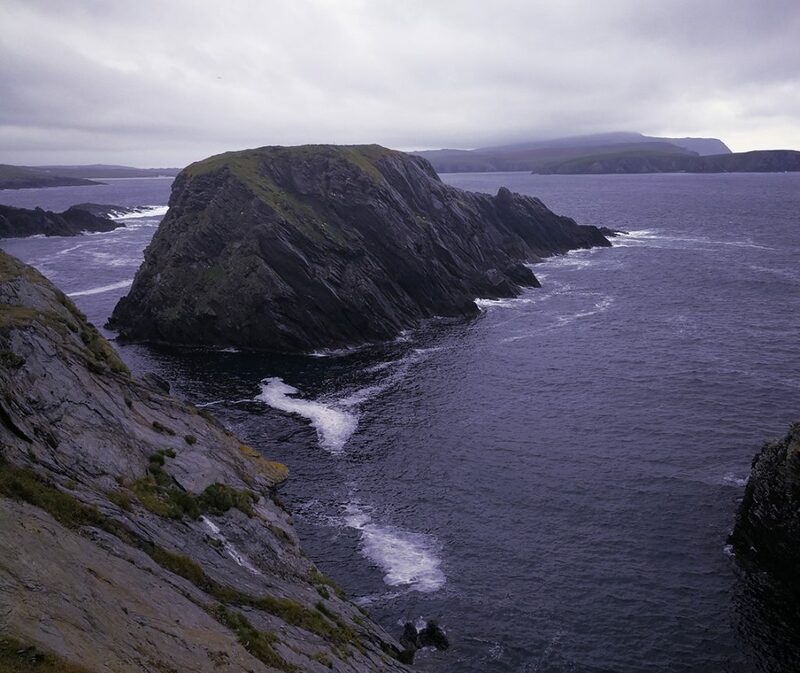 If you journey to the Outer Hebrides, you’re sure to be spoilt for choice when it comes to buying Harris Tweed products. My top pick is Rarebird studio in Stornoway which combines a skilful blend of reassuring tradition and modern flair into each handmade Harris Tweed creation. To ensure its provenance each item carries the Rarebird Corncrake logo and Harris Tweed Orb label. For chocolate lovers, The Scottish Chocolate Centre is a must. The centre is located in Grandtully, just five miles from Aberfeldy, and is Home to the Highland Chocolatier, Iain Burnett himself, who is dedicated to chocolate and its origins. The centre also houses an enchanting, vintage style gift shop. Perfect for those last-minute purchases for family and don’t forget to but yourself a few of the centre’s award-winning dark velvet truffles to take home. Situated on colourful Tobermory’s Main Street, the Isle of Mull Soap Co. produces its natural soaps by hand using the traditional cold process method using the finest quality essential oils & botanicals. Psst….we hear their ‘Buzz Off’ soap is great for fighting off our wee midgie friends! 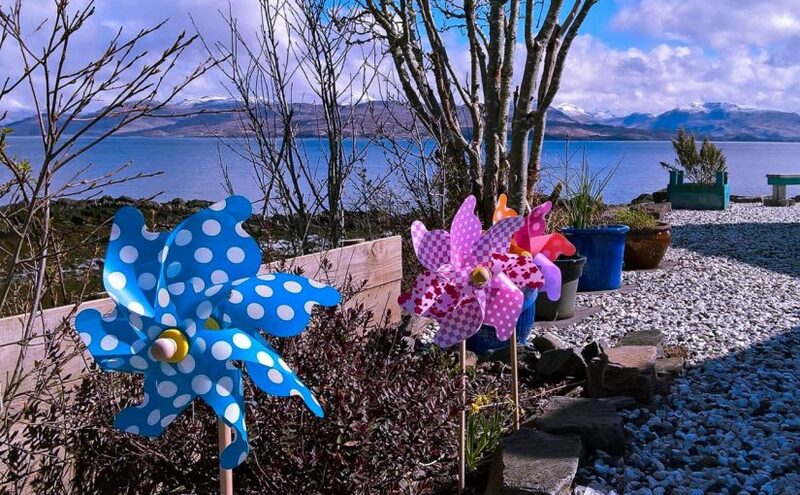 Posted on 29th June 2016 31st August 2016 Author EmmaCategories General, ScotlandTags gift shops, harris tweed, highland chocolatier, mull, outer hebrides, scotland, shetland, skye3 Comments on Been there, done that, where to get the T-shirt?